"It has been a very busy, whirlwind year," Secretary of State Rex Tillerson said, on the first anniversary of his tenure as the nation's highest-ranking diplomat. In a speech on U.S.-Latin America policy, Tillerson told an audience at his alma mater, the University of Texas, "It's really nice to celebrate with my friends back home." 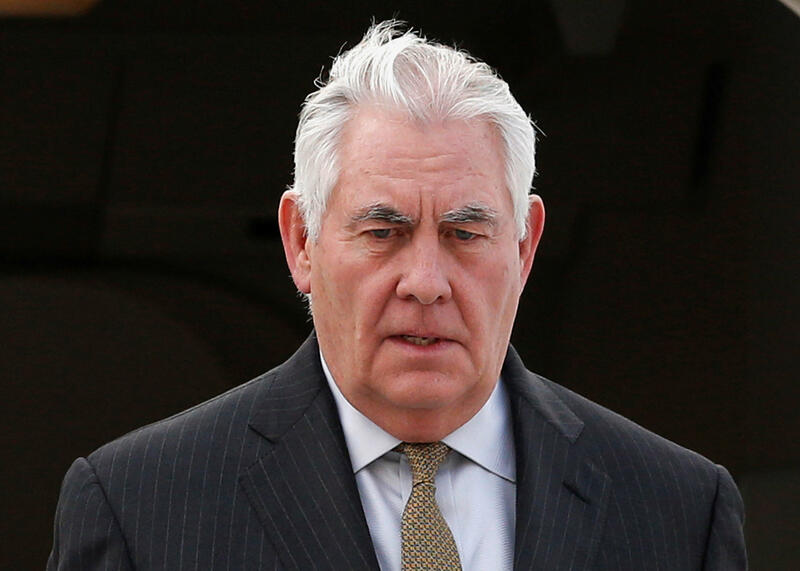 Tillerson spent little time reflecting on what has almost universally been considered a bumpy first year, fending off criticism about a president who often publicly undermines him, as well as for the perception of disarray at the State Department. Instead, wearing a pin with the Texas and American flags, Tillerson reminisced about getting his first passport for a trip to Peru after an earthquake. Then, he launched into the diplomatic tremors destabilizing Latin America policy. He pointed to the chaotic leadership in Venezuela, even seeming to welcome regime change, if not outright advocating it. Venezuela is teetering on the bring of economic collapse, and President Nicolas Maduro is up for re-election in the next couple of months. Tillerson also warned of "predatory" actors in the hemisphere, like Russia and China. He deemed Russia's expanding presence in the region "alarming," noting its sales of military equipment to undemocratic actors and regimes. Maduro, whom the U.S. has consistently condemned for flouting the constitution and refusing to hold free and fair elections, is one of the leaders who has benefitted from Russia's support. "The corrupt and hostile regime of Nicolas Maduro in Venezuela clings to a false dream and antiquated vision for the region that has already failed its citizens," Tillerson said. He noted that the government has declined U.S. medical support. When a student in the audience asked Tillerson about regime change, Tillerson said that the U.S. wants a peaceful transition. And in a playful tone, he also said Maduro could vacate the country and turn to the Cubans for refuge. "President Maduro could choose to just leave," Tillerson said, explaining that the U.S. has not advocated for violent regime change. "If the kitchen gets a little too hot for him, I'm sure that he's got some friends over in Cuba that can give him a nice hacienda on the beach, and he can have a nice life over there." China is now the largest trading partner for many Latin America countries including Chile, Argentina, Brazil, and Peru. But Tillerson warned that its investment comes at a price: unsustainable debt and the sidelining of human rights concerns. The secretary touched on three pillars of U.S. engagement with the region: economic growth, security and democratic governance. Amid tensions between the U.S. and Mexico that have existed since day one of the Trump administration, Tillerson's goal of driving forth "deeper relationships" will be a challenge to implement. For example, NAFTA talks have been rocky, and U.S. allies in the western hemisphere are frustrated with the negotiations, which they say are being hampered by Mr. Trump's America First foreign policy. Earlier this year the Mexican ambassador to the U.S. told CBS News that the odds of NAFTA lasting were 50-50. At a meeting on the trade deal in Canada earlier this year, U.S. Trade Representative Robert Lighthizer said "some progress" had been made but urged Mexico and Canada to dig in deeper for some "major breakthroughs." In his speech Tillerson acknowledged that NAFTA negotiations have been "tough" but said that the goal is to strengthen the economy for "all of North America." Though President Trump has threatened to terminate NAFTA, Tillerson told the crowd that his Texas roots mean he understands how important the trade deal is to jobs and income in the state. Texas has increased exports to Canada and Mexico by up to $16 billion since 1993, when NAFTA was enacted and, according to the U.S. Department of Commerce. Tillerson is traveling to Mexico, Argentina, Columbia and Jamaica this week where he will discuss U.S. relations and the importance of democratic institutions with his counterparts. The University of TexasLonghorn Band joined him on the stage for a rendition of "The Eyes of Texas" before Tillerson embarked on his trip.